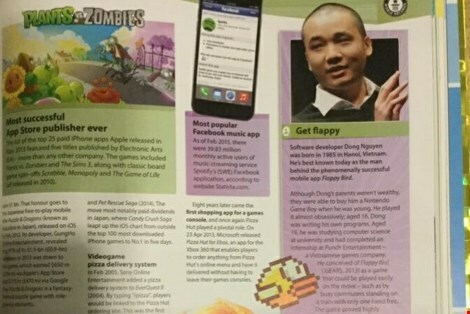 Famous app developer Nguyen Ha Dong, creator of the globally popular mobile game Flappy Bird, has become the only Vietnamese to get in the Guiness Book of World Records 2016, according to Lao Dong newspaper. According to the Guiness Book, Flappy Bird sets a record as the first app to be withdrawn after topping the Apple App Store chart. Born in 1985, Dong started developing games at the age of 16. He released the addictive Flappy Bird on the Apple App Store in May 2013, but the game would only become popular worldwide in early 2014. It is believed that the mobile app netted its creator 50,000 USD a day. However, Dong officially removed the game from the chart on February 10, 2014. Last year, Forbes Vietnam, the Vietnamese edition of renowned American business magazine Forbes, listed Nguyen Ha Dong among 30 of the country's brightest stars under the age of 30.